Last October, a report surfaced which shows that a Colorado rancher and livestock hauler purchased 1,794 wild horses and willingly and illegally sold each of these magnificent wild a nimals to suffer a brutal death at slaughterhouses in Mexico. The rancher, Tom Davis, bought the horses through the Wild Horse and Burro Program, administered by the Bureau of Land Management. This government agency spent more than $140,000 to transport wild horses to Davis between 2008 and 2012. This means that $140,000 of taxpayers’ money has been spent toward illegal horse killings. 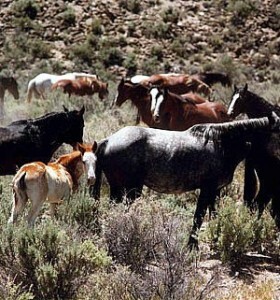 The BLM is attempting to wash its hands clean of the blood of thousands of wild horses. Justice must be obtained for the victims of this mass slaughter. The Department of the Interior and the US Department of Justice have given little response so far. We must show them that horse killers like Davis must be prosecuted.